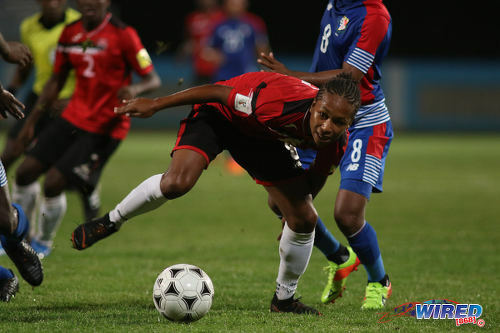 The Trinidad and Tobago Men’s National Under-20 Team will not have the benefit of using the Trinidad and Tobago Super League (TTSL) competition to warm up for their Poland 2019 World Youth Cup campaign. Yesterday, the TTSL’s member clubs voted to reject the national team’s application for a place in its 2018 season, after the Trinidad and Tobago Football Association (TTFA) failed to meet the deadline for payment of a TT$50,000 registration fee. Photo: Teenaged Trinidad and Tobago midfielder Judah Garcia (centre) tries to keep hold of the ball during friendly senior team international action against Panama at the Ato Boldon Stadium in Couva on 17 April 2018. Garcia is also a member of the National Under-20 Team. 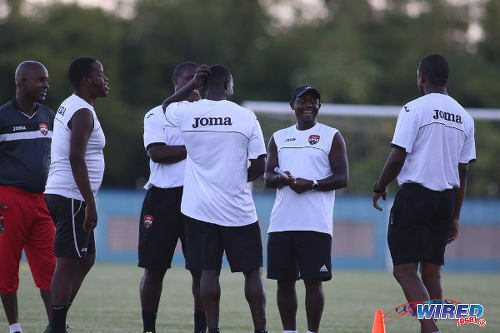 The young Russell Latapy-coached Soca Warriors, who begin their Caribbean qualifying phase in November, were one of nine outfits blocked from participating this season owing to either non-payment of fees or non-compliance. The other teams who will not suit up for the second-tier competition in 2018 are Defence Force, Harlem Strikers, WASA FC, Siparia Spurs, Central 500 Spartans, Perseverance Ball Runners, Youth Stars and the Marabella Family Crisis Centre. Tobago 1976 Phoenix FC and Erin FC received a stay of execution. Phoenix claimed their payment had been wired to the TTSL before the deadline of Friday 4 May and must now prove it. And Erin, who are newly promoted from the Southern Football Association (SFA), paid half of their fee with the SFA standing as guarantor for the remainder. The SFA must come good on that promise before the start of the season or Erin will not play either. It means that, for the 2018 season, the TTSL has 13 clubs which will play in one division—as distinct from the 19 teams split into two divisions as was the case in 2017. The accepted clubs are Guaya United, FC Santa Rosa, University of Trinidad and Tobago (UTT), Prisons FC, QPCC, Petit Valley/Diego Martin United, Cunupia FC, Club Sando, Bethel United, Police FC, Matura Reunited and the newly promoted duo of RSSR and San Fernando Giants. TTSL president Keith Look Loy explained his body’s decision to rescind its invitation to the National Under-20 Team. 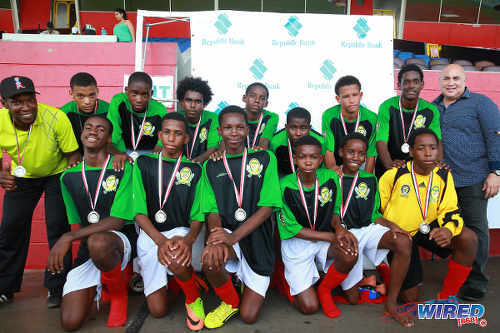 The Under-20 Team leaves for Guadeloupe on 15 May for an invitational tournament which should also include Costa Rica and Martinique. 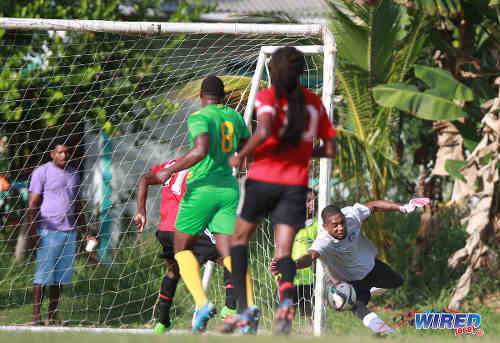 The Under-20s’ failure to get into the TTSL competition follows on the heels of a similarly unsuccessful bid by the Under-17 Team to play in the 2018 Youth Pro League (YPL) competition, their proposed participation vetoed after the TTFA missed the application deadline. Latapy also coaches the Under-17’s. The national youth team’s problems hardly commanded centre-stage yesterday, though, as the decision to sideline nearly half of the TTSL’s 2017 participants led to heated exchanges. Yesterday, Club Sando passed a motion that only clubs who met the TTSL’s registration deadline would be accepted to participate in the upcoming season. San Fernando Giants seconded the motion and, in the subsequent vote, nine clubs voted in favour, five against and four abstained. It sealed the fate of the clubs for the 2018 season. 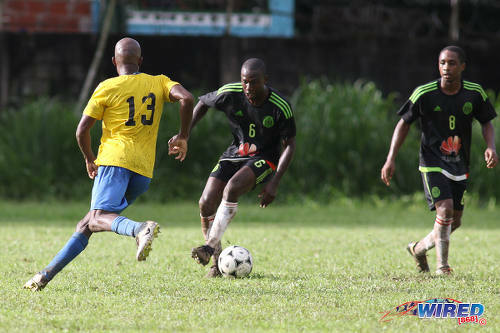 Photo: Petit Valley Diego Martin United playmaker Keron Cummings (centre) prepares to take on a Central 500 Spartans opponent (left) during TTSL Two action at the Diego Martin North Secondary ground on 15 July 2017. 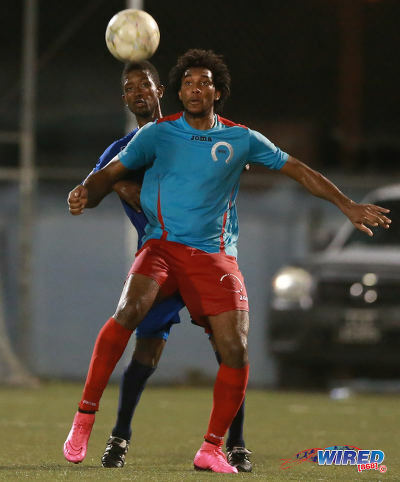 Harlem Strikers manager and vice-president Gregory McSween was livid. He showed up at the TTSL’s meeting on Saturday with a cheque for the full registration fee. But it was not accepted since he had missed the deadline. “We got the cheque from our sponsor [Cengem Construction Company from Chase Village] on Saturday morning and [Look Loy] said they’re not accepting that,” McSween told Wired868. “You don’t get people to put this kind of money into football now… For us to get back in the Super League, we went through a set of things to get compliance; we went to Legal Affairs to get Harlem Strikers registered and so on. 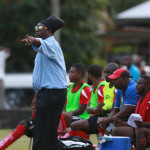 “We done buy uniforms, spectator tee-shirts printing, we have our coach [former national youth player and Defence Force defender Devin Jordan] training the team and getting ready. And, after all that, we didn’t get in? Yet, bizarrely, McSween appeared to have voted in favour of yesterday’s motion, which essentially sealed Harlem’s fate. 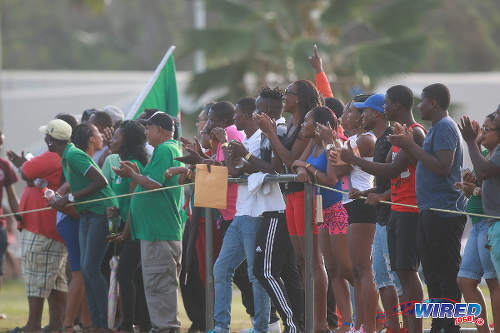 Although the administrator did not answer conclusively when asked about his vote, TTSL records show that Harlem said ‘yes’ to starting the 2019 season with only the clubs who met Friday’s deadline. Defence Force (TTSL) manager Ryan Ottley, who was a defeated presidential candidate in the TTSL’s election last year, suggested that “some” club representatives were not paying attention and did not understand which way they were voting. 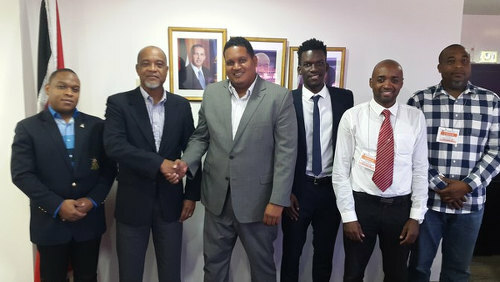 Photo: Then TTSL interim executive (From left to right) Lt Ryan Ottley (TTSL interim VP), Keith Look Loy (TTSL interim President), then Sport Minister Darryl Smith, Camara David (TTSL Secretary), Kester Lendor (TTSL interim Assistant Secretary) and Quincy Jones (interim Board member). Ottley and McSween have since announced their intention to start a lobby group, which will petition the TTFA for assistance in getting into the TTSL’s 2018 competition. Ottley accused Look Loy of favouritism and claimed that the TTSL extended its deadline to 4 May—without informing other clubs—so that Erin could make a partial payment. “There was no message to anybody that they had until Friday [4 May] to pay the registration fee,” said Ottley. “They told everyone else the 30th [of April]. Nobody knew they had extra time, especially Defence Force. 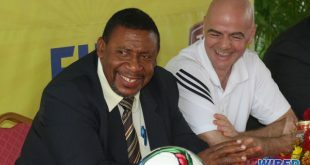 However, both Eligon and the TTSL President disputed Ottley’s claim that member clubs had no prior warning of the registration extension. “The decision to extend the deadline was taken at a [TTSL] board meeting on 1 May,” said Eligon. McSween and Ottley were also aggrieved at the TTSL’s decision to allow Erin to participate with only a part-payment, which they felt was inconsistent with the demands made of other teams. “[Yesterday] Marabella asked for two additional days to make payment and they said no,” said McSween. “Perseverance won TT$25,000 from the Central Zone and they had a cheque for TT$5,000 and [Look Loy] said he’s not accepting part-money. “But Erin paid TT$25,000 with an agreement from their zone to send the remaining money to the Super League. So how are they getting time to pay? Isn’t that part-payment too? Responding, Look Loy pointed to a precedent for accepting a promissory note in lieu of payment by a club. He said the TTSL membership voted to accept the same thing last year, when the Central Football Association (CFA) offered a letter of comfort for Perseverance—based on prize money owed to the club. And he insisted that there was no comparison between the circumstances of Erin, Harlem and Marabella. Photo: Marabella Family Crisis Centre striker Juma Clarence (front) is watched closely by FC Santa Rosa defender Alfie James during 2015/16 CNG NSL action in Macoya. “Erin paid TT$15,000 before the expiry of the first deadline on 30th of April,” said Look Loy, “and then we said we would allow a new deadline and anyone who made the payment by then, we would accept. San Fernando Giants paid TT$19,250 before [30 April], then they completed their payment on the 4th of May. “Erin came up with a further TT$7,700 by the 4th of May. However, in addition to that, they produced a letter from the Southern FA […] which would cover the balance of their payment to the Super League. Look Loy stressed that all teams got to present their case at Saturday’s meeting. And, in the end, it was the TTSL’s membership that voted to proceed without the non-paying clubs. “Clubs like Army somehow find it impossible to make a payment and didn’t even offer a defence for their failure to pay,” said the TTSL president. “But they are demanding an extension, when brand new clubs come in and within three months are able to do all that is required of them—they are compliant and paid up. Also in the photo (far right) is Republic Bank manager Anthony Subero. RSSR catchment area includes Port-of-Spain South and Laventille West, including Beetham Gardens. Look Loy said some teams pointed to the social good done by community clubs as further grounds for leeway. His retort was that such teams could continue to impact positively on their neighbourhoods by playing zonal football. “We cannot continue with the same decadent, lackadaisical culture that has persisted in our football for decades,” said Look Loy. “We have to introduce a respect for regulations [and] people have to understand that protocol and procedure is important to improve our football. Some teams will kick against it, some will fall by the wayside but the rest will improve. “[We know] this is a paradigm shift. People here like to talk about treating football like a business; but when the business of football starts to squeeze their toe, they start to kick and scream. Fair points, however one may want to consider the fact that the Super League is under the authority of the TTFA. Look Loy, whilst trying for change, will in fact shoot himself in the foot because one has not heard about a late registration fee or any payment plan. It is reasonable to have mechanisms in place when there is a National downturn in the economy. Although members have voted, sometimes they may not understand the full magnitude of the dynamics invoved. Sponsors may specifically donate items that the sponsor wants to donate. It is quite interesting that the ECFU is not operational (from a previous article) yet a team from there seems to be compliant. Teams ought to be administered through zones or associations (not 100% sure). If this team is given the right to participate and other clubs are not given the right to, then this year a lot of youths would not be able to express themselves in a World Cup year because the protocols will be applicable to one and not applicable to all. Mr. Look Loy will have to live with this. If National Men or Women’s teams are not allowed to participate in any league then it means that taxpayers dollars behind these teams would be going to waste. My view might change tomorrow but tonight it is that the TTFA ought to step in and compel the League to include the National teams or ask them to revisit a model that will allow for National Team participation for free which may or may not not qualify them for prizes or acolades. One has to be wary that a League ought to function with an agreement with the TTFA. One cannot fathom that monies are owed, teams are being blanked and the national teams are made to pay money (towards a prize)! Too much is at stake for the parent body of the sport in Trinidad and Tobago to fork out .tens of thousands of dollars to play in a league that it is ultimately responsible for sanctioning. A National Team cannot play a tournament inside of Trinidad and Tobago? 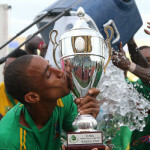 The TTSL still owes teams 200000 for last years league cup!! No financial reports for last season!! No marketing plan for the league! ! Let the league get it house in order first and show the business side of football! ! “The deadline [to pay the TTSL’s registration fee] was moved from [April] the 13th to 30th and then Friday 4th [of May],” said Matura Reunited general manager Maurice Eligon. “Anybody who was late but paid by then was accepted in the best interest of football.”…. This is what the article stated. Is it incorrect? If yes, then I can understand what you’re saying. If not then…. No prize money was paid?? I take it that it had a meeting to make these decisions. Did any of the teams bring a point of order to address the non payment of same? It seems the teams who paid, voted, which seems sensible and just. Even one member who voted to exclude some teams, could not make the deadline. So I go back to my original statement, unless there’s some other info that we are not privy to. Why didn’t the managers of the excluded teams not communicate with the organizers. Why wait till the end to try to get in? Why participate in a league which is not organized and paying prize monies? Yup. Trinis sweet.. Very instructive comments! If only this could have a rippling effect in all other aspects of our society, business and otherwise. From 32 to 13 to 15…..YES, but at sometimes life situations dictate that 2 steps be taken backwards in order to move 6 steps forward. One needs to get with the program or be left behind. Be guided! Adhere to the RULES. But the Judiciary allowed a Calypsonian who did not submit an Application Form and did not pay his money, to participate in the Calypso Monarch competition!! If a man got a 24 two tier league with prize money to run and one year later have 13 team one tier league with no prize money he is an absolute failure!! Talking about business of football and don’t have a marketing plan for the league!! Didn’t bring one red cent to the league but his team got a 50000 dollar sponsorship from nlcb through his friend Selby Browne, sponsorship from carib through his buddy Colin Murray!! Talk about conflict of interest bartering TTSL votes to profit Santa Rosa! ! So even with the extension being made with or without the Defense Force being notified, they still made no payment of registration and they’re complaining when they made no payment up until even the extended period? How does one justify that argument? Has purchased uniforms AND SUPPORTER jerseys but could not make a down payment to plead a case of requesting time before the deadline was gone? Maybe I’m biased from a business perspective, but for a competition to function they should have all monies that they require or catered for before the start for their planning and preparations. And if my understanding is correct from the reading of this and previous articles then meetings were held and decisions were made long before this date. And didn’t last year’s season also have to adopt a similar stance and some teams weren’t allowed to play in the league? Priorities should have been adjusted in the case of Harlem, the uniforms and spectators jerseys was not a priority but the registration was. …..owing to the absence of discipline to do the right things and still expecting a ‘bligh’ while blaming everybody else in the process.